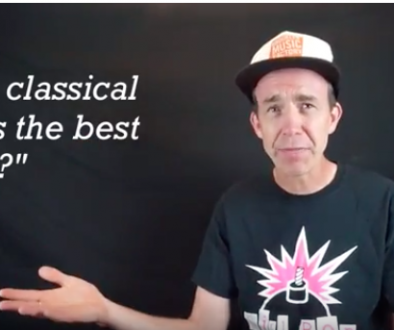 You want to support your kids’ musical progress and make your home more musical, but where to start? 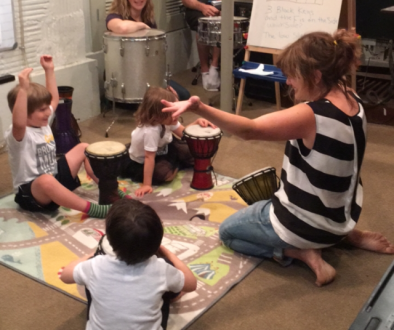 Music lessons for kids are almost a no-brainer these days. The benefits of playing music are endless: better communication skills, increased cognitive reasoning, the ability to think ahead… Plus, playing music is really fun! That said, supporting your child on his or her musical journey can be challenging or even downright intimidating. And lots of parents aren’t sure how to encourage their child’s music progress, beyond admonishing them to “Go practice!”. (And, let’s be honest, that approach doesn’t usually work that well.) So what’s the first step to making your home more musical, therefore ensuring your children will sit down to play music often? 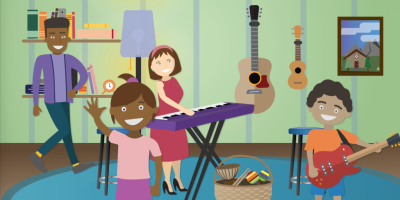 Setting up a fun and welcoming music play space for your family is a great place to start! We believe that music can and should be a communal activity in the home. When playing music is a group activity for the whole family, the rest comes a whole lot more easily. That’s why setting up a fun and welcoming play space is so important. Here is our comprehensive list of what you need to build an AWESOME play space in your home. Your entire family will be playing music together in no time! The teachers at Brooklyn Music Factory have created the ultimate list of gear for your play space, including everything from keyboards to guitars to a fully stocked percussion basket with extra goodies and accessories. We know the items on this list are a good value, because they have stood up to the wear and tear of being used by hundreds of students at our school in Brooklyn! Don’t forget to download our free Musical Family Toolkit which includes our Gear Resource Guide, for a more in-depth look at all of the instruments listed below, plus links to purchase straight from Amazon if you’re ready to go. A piano (or keyboard) will be the centerpiece of your play space at home, even if no one is actually taking piano lessons just yet. Having a piano at the center of your home is a great reminder to make music as a family all the time! Weighted keys feel more like a real piano and, while a weighted keyboard costs a more, you may want to go with this option if your family is serious about piano. A keyboard with unweighted keys is perfectly fine if your child is just starting out, and is between the ages of 4 and 7. Unweighted keys are easier for little fingers to push down! And an unweighted keyboard costs less than a weighted one. Don’t forget these essential items! If your child is just beginning–and between the ages of 5 and 9, start with an acoustic guitar. Acoustic guitars are good for beginners because they are portable and can be picked up and played right away–without needing or having to mess around with an amp. When choosing a guitar–acoustic or electric–you will find that there are three sizes. See below for the sizes we generally recommend for each age group, but we encourage you to stop by your local music store to try out the different sizes and decide which one feels good to you! We hope this list helps you get your play space up and running! Your home will be a creative music environment in no time, for your whole family to enjoy. Now let’s make some music!